TORONTO, ONTARIO--(Marketwired - Oct. 28, 2014) - Continental Gold Limited (TSX:CNL)(OTCQX:CGOOF) ("Continental" or the "Company") is pleased to announce initial channel sampling results from both the main cross-cut and drift accessing the Veta Sur Vein System at the Company's 100%-owned Buriticá project in Antioquia, Colombia. Approximately 800 metres of total underground development accessing Veta Sur has been completed to date with development face dimensions averaging 3.5 metres X 3.5 metres. This underground development program has provided the Company with its first ever underground access into the Veta Sur deposit and is expected to be completed by the end of November 2014. Initial results from systematic channel sampling of both the cross-cut and along Vein 62 and Vein 51 through the central Veta Sur system have ratified the locations and orientation of several veins in the current mineral resource model. 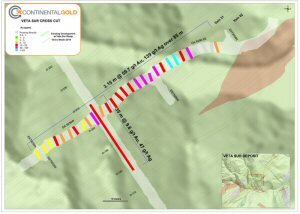 30 metres (true horizontal width) @ 9.6 g/t gold and 47 g/t silver. This zone is significantly broader than the corresponding area of the current mineral resource model and the mine plan for the upcoming Preliminary Economic Assessment ("PEA"), scheduled for release in Q4 2014. 3.15 metres (true horizontal width) @ 59.7 g/t gold and 139 g/t silver along 85 metres. High-grade mineralization remains open to the northeast and southwest where it will be tested in further development. Mineralization is generally present at both the northwestern and southeastern edges of sampled faces, suggesting that the true width of the zone may be broader than 3.15 metres presently outlined. This zone is significantly higher grade and broader than the current Measured and Indicated grades of the veins along this 85-metre segment where Vein 62 and Vein 51, combined, average 2.1 metres @ 27.3 g/t gold and 134 g/t silver in the current mineral resource estimate prepared in accordance with National Instrument 43-101 ("NI 43-101"). Mineralized structures between and with orientations differing from the main veins are common in underground developments. These features can lead to broadening of mineralized envelopes relative to the hard boundary vein domains employed in the current mineral resource model, which do not include such features. The additional mineralized structures are concentrated in areas that are proximal to contact zones between the andesitic intrusions, sediments and breccias. A series of short cross-cuts, to the northwest and southeast from the drift along Vein 62 and Vein 51, have commenced to assess the continuity of the bulk zone of mineralization discovered in the main cross-cut, as well as mineralization on the margins of the Vein 62 and Vein 51 zone. Short drifts from the main cross-cut, to assess the lateral continuity of other modelled veins, are also planned to commence shortly. A bulk sample of material blended from both the drift and the cross-cut will be processed through the pilot scale mill of the Yaraguá mine for mining reconciliation purposes. Results will be released once they have all been received and compiled. 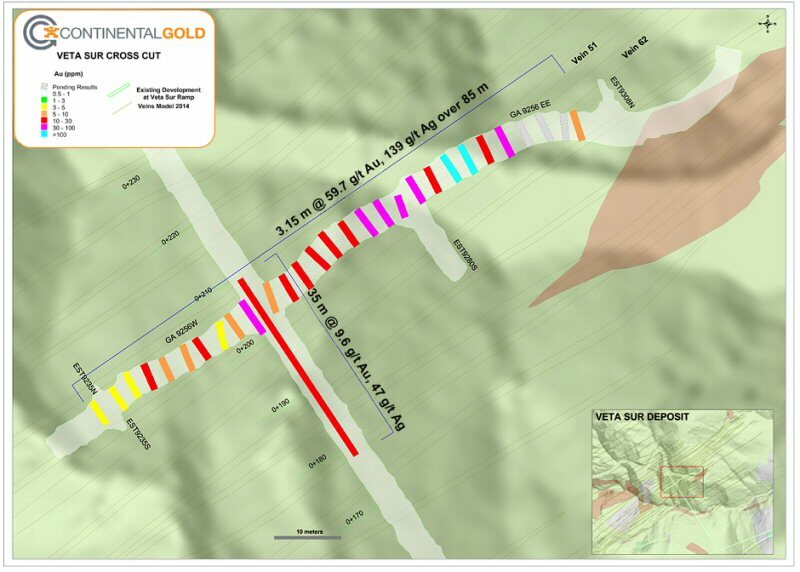 "Continental's first underground sampling in the Veta Sur system has demonstrated the continuity of high-grade mineralization over widths greater than anticipated from the current mineral resource model and in provisional mine planning. The Veta Sur experience complements that from the Company's extensive development in the Yaraguá system and is encouraging for potential mining at Buriticá," commented Ari Sussman, CEO of Continental. Continental's 100%-owned, 62,425-hectare project, Buriticá, contains several known areas of high-grade gold and silver mineralization, of base metal carbonate-style ("Stage I") variably overprinted by texturally and chemically distinctive high-grade ("Stage II") mineralization. The two most extensively explored of these areas (the Yaraguá and Veta Sur systems) are central to this land package. The Yaraguá system has been drill-outlined along 1,100 metres of strike and 1,500 vertical metres and partially sampled in underground developments. The Veta Sur system has been drill-outlined along 1,000+ metres of strike and 1,500 vertical metres. Both systems are characterized by multiple, steeply-dipping veins and broader, more disseminated mineralization and both remain open at depth and along strike, at high grades. See "About Continental Gold" below for a précis of updated mineral resource estimates for the Buriticá project prepared in accordance with NI 43-101. This release documents the results of sampling of the first underground developments in upper parts of central Veta Sur. Significant new channel sampling results are listed below in Table I and are referenced in Figure 1. * Channel samples are taken continuously along the walls of the underground cross-cut and across the face of the underground drift. Faces are nominally spaced every 3 metres along the drift and face composites average six length-weighted channel samples. Widths are true horizontal metres at 0 g/t gold cut-off grade. The main underground cross-cut through the Veta Sur deposit is located at an elevation of 1,690 metres above sea level with approximately 255 metres completed to date. Eighteen veins have been observed in the crosscut and their locations and orientations accord well with corresponding areas outlined in the current mineral resource estimate prepared in accordance with NI 43-101. Narrow vein structures (veinlets), at different orientations to the northeast-southwest strike of the main veins in the current mineral resource model, have been observed in the cross-cut (and in the Vein 62 and Vein 51 drift). These narrow structures are generally not included in mineral resource modelling. However, in certain locations, these structures tend to swarm, resulting in mineralized structures of up to 5 g/t gold over reasonable widths situated between and contiguous with modeled veins, adding to the widths of mineralized envelopes around main veins. These locations are commonly in areas of intense fracturing, proximal to contact zones of the andesite intrusions with sediments and/or breccias. This zone is significantly thicker than the corresponding area of the current mineral resource model and in the mine plan for the upcoming PEA, scheduled for release in Q4 2014. Additional channel sampling results for the balance of the cross-cut are outstanding. The bulk mineralized zone remains open to the southwest and northeast where it will be further tested by cross-cuts, commenced and planned, from the Vein 62 and Vein 51 drift. Short drifts from the main cross-cut will examine the continuity of high-grade veins within the mineralized zones. Mineralization is generally present at both the northwestern and southeastern edges of the sampled face, suggesting that the true width of the zone might extend past the 3.15 metres presently outlined. In addition, this zone is significantly higher grade than the current Measured and Indicated grades of the veins along this 85-metre long segment of the current mineral resource model, wherein Vein 62 and Vein 51, combined, average 2.1 metres @ 27.3 g/t gold and 134 g/t silver. The Vein 62 and Vein 51 mineralized zone remains open to both the northeast and southwest with channel sampling continuing until the completion of the drift later this year. The cross-cuts from the Vein 62 and Vein 51 drift will facilitate evaluation of mineralization on the margins of this zone. A bulk sample of material blended from both the drift and the cross-cut will be processed through the pilot scale mill at the Yaraguá mine for mining reconciliation purposes. Results will be released once they are all received and compiled. Channel samples are taken continuously along the walls of the underground cross-cut and across the face of the underground drift. Faces are nominally spaced every 3 metres along the drift, and face composites average six length-weighted channel samples. Widths are true horizontal metres at 0 g/t gold cut-off grade. The Company utilizes a rigorous, industry-standard QA/QC program. Rock samples are shipped to a sample preparation lab run by ALS Colombia Limited ("ALS") in Medellín, Colombia. Samples are then shipped for analysis to an ALS-certified assay laboratory in Lima, Peru. Blanks, duplicates and certified reference standards are inserted into the sample stream to monitor laboratory performance and a portion of the samples are periodically check assayed at ACME Analytical Laboratories in Vancouver, British Columbia and/or Inspectorate America Corp. in Reno, Nevada. Crush rejects and pulps are returned and stored in a secured storage facility for future assay verification. Continental Gold Limited is an advanced-stage exploration and development company with an extensive portfolio of 100%-owned gold projects in Colombia. Spearheaded by a team with over 40 years of exploration and mining experience in Colombia, the Company is focused on advancing its high-grade Buriticá gold project to production. On May 13, 2014, the Company announced an updated mineral resource estimate for the Buriticá project prepared in accordance with NI 43-101. This estimate covers the Yaraguá and Veta Sur vein systems, with a combined Measured mineral resource of 0.99 million tonnes of mineralized material containing 0.65 million ounces of gold grading 20.4 g/t gold, 1.54 million ounces of silver grading 48 g/t silver, and 15.0 million pounds of zinc grading 0.7% zinc, and a combined Indicated mineral resource of 7.41 million tonnes of mineralized material containing 2.15 million ounces of gold grading 9.0 g/t gold, 6.89 million ounces of silver grading 29 g/t silver, and 75.1 million pounds of zinc grading 0.5% zinc. The combined Inferred mineral resource is 16.7 million tonnes of mineralized material containing 4.2 million ounces grading 7.8 g/t gold, 13.1 million ounces of silver grading 24 g/t silver and 111 million pounds of zinc grading 0.3% zinc. In August 2012, Continental achieved an important milestone, receiving formal approval for the modification of its existing Environmental Impact Assessment. The amendment allows the Company to build a six-kilometre switchback road and begin underground development by constructing a one-kilometre access tunnel. With a goal of being the newest hard rock gold producer in Colombia, Continental has achieved major advances with the access tunnel, which is providing access for underground drilling and will eventually be used for commercial production. Future development is dependent on, among other things, continued exploration success, environmental and board approvals, completing positive economic studies and the determination that the deposit is economically viable. A Phase V drill program is underway at the Buriticá project to further delineate the mineral resources and drill new target zones identified within its concessions. This press release contains or refers to forward-looking information under Canadian securities legislation, including statements regarding the estimation of mineral resources, exploration results, potential mineralization, completion of a PEA, and exploration and mine development plans, and is based on current expectations that involve a number of business risks and uncertainties. Forward-looking statements are subject to significant risks and uncertainties, and other factors that could cause actual results to differ materially from expected results. Readers should not place undue reliance on forward-looking statements. Factors that could cause actual results to differ materially from any forward-looking statement include, but are not limited to, failure to convert estimated mineral resources to reserves, capital and operating costs varying significantly from estimates, the preliminary nature of metallurgical test results, delays in obtaining or failures to obtain required governmental, environmental or other project approvals, political risks, uncertainties relating to the availability and costs of financing needed in the future, changes in equity markets, inflation, changes in exchange rates, fluctuations in commodity prices, delays in the development of projects and the other risks involved in the mineral exploration and development industry forward-looking statements are subject to significant risks and uncertainties, and other factors that could cause actual results to differ materially from expected results. These forward-looking statements are made as of the date hereof and the Company assumes no responsibility to update them or revise them to reflect new events or circumstances other than as required by law. This press release was prepared in accordance with Canadian standards, which differ in some respects from United States standards. In particular, and without limiting the generality of the foregoing, the terms "inferred mineral resources," "indicated mineral resources," "measured mineral resources" and "mineral resources" used or referenced in this press release are Canadian mining terms as defined in accordance with National Instrument 43-101 - Standards of Disclosure for Mineral Projects under the guidelines set out in the Canadian Institute of Mining, Metallurgy and Petroleum (the "CIM") Standards on Mineral Resources and Mineral Reserves (the "CIM Standards"). The CIM Standards differ significantly from standards in the United States. While the terms "mineral resource," "measured mineral resources," "indicated mineral resources," and "inferred mineral resources" are recognized and required by Canadian regulations, they are not defined terms under standards in the United States. "Inferred mineral resources" have a great amount of uncertainty as to their existence, and great uncertainty as to their economic and legal feasibility. It cannot be assumed that all or any part of an inferred mineral resource will ever be upgraded to a higher category. Under Canadian securities laws, estimates of inferred mineral resources may not form the basis of feasibility or other economic studies. Readers are cautioned not to assume that all or any part of measured or indicated mineral resources will ever be converted into reserves. Readers are also cautioned not to assume that all or any part of an inferred mineral resource exists, or is economically or legally mineable. Disclosure of "contained ounces" in a resource is permitted disclosure under Canadian regulations; however, United States companies are only permitted to report mineralization that does not constitute "reserves" by standards in the United States as in place tonnage and grade without reference to unit measures. Accordingly, information regarding resources contained or referenced in this press release containing descriptions of our mineral deposits may not be comparable to similar information made public by United States companies. Figure 1 - Plan View of the Veta Sur Cross-Cut and the Vein 51 and Vein 62 Drift showing the projection of veins in the current Veta Sur mineral resource model on geology-topography and underground developments. The gold grades of composited channel sample results are color-coded according to the legend.